Save in running costs and get more work done, faster, with a high performance Rock Digging Bucket. Guaranteed to perform 30% better. High-performance excavator Rock Digging Buckets from eiengineering will improve your productivity and performance. With a streamlined design, for easier bucket filling to move more material without compromising on penetration and digging ability, our Rock Digging Buckets earn you more money moving more material. The double radius profile is a standard feature of all eiengineering digging buckets. It allows the bucket to follow the teeth through the cut with easier filling as the result. This also creates high break-out force and less drag. As a result, our rock buckets load easier and fill quicker for fast cycle times, reduced fuel consumption and lower maintenance and repair costs than the majority of conventional excavator buckets. Every day that goes by while using an older ineffective bucket is costing you in running costs, so contact us today for a quick free quote. 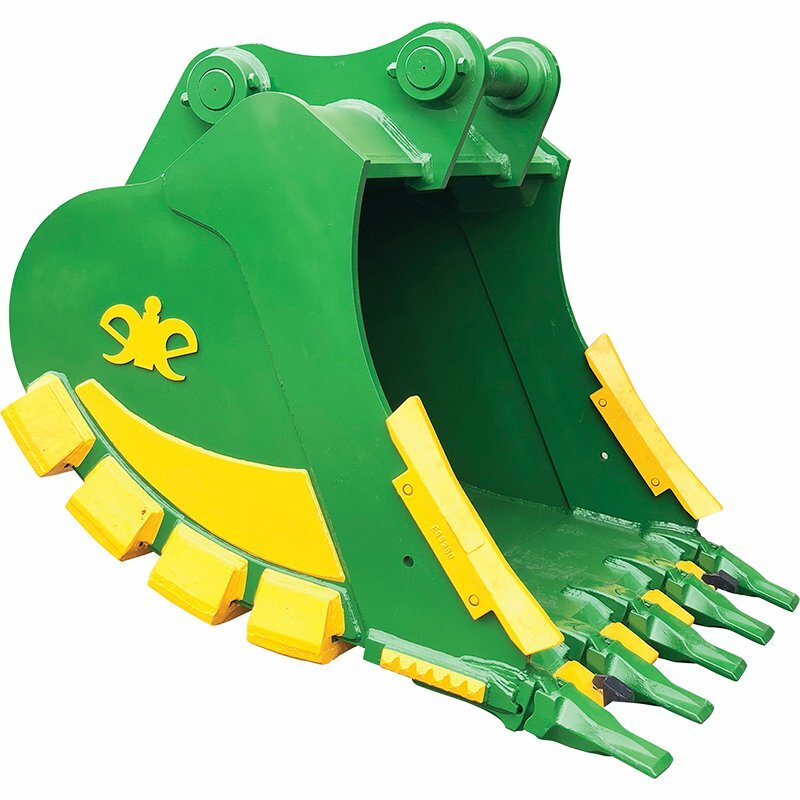 Note: Our wear packages include inner and outer bucket liners, side plate protection, heel blocks, shrouds, carbide blocks, hard facing and arrow head edge protection and are provided with a wide range of teeth and adapters suitable for the heavy rock excavation environment. Short Pin-to-Point Bucket Design – Delivers superior bucket breakout force and penetration without losing bucket capacity. Double Radius Backplate – Increases performance and reduces wear and stress on the excavator. Ensures the load is kept high in the bucket, for easier buckets fills over traditional buckets. Tapered Design – Ensures only the teeth and side edges to come in contact with rocks. Reduces bucket drag ensuring maximum efficiency. Earth-Dynamic Design – Reduces bucket drag through the material, allowing it to move more efficiently, moving more material. Heavy Duty Robust Construction – Increased strength, durability and bucket life. Optional Wear Packages – eiengineering Rock Buckets are specifically designed for the application with wear packages fitted to sufficiently armour the bucket to offer the highest abrasion resistance possible*. *pin-to-point is the distance between the bucket’s pin and the tip of the tooth. A shorter pin-to-point measurement lessens the leverage offering much greater power.